Female composers have, throughout history, received far fewer plaudits than their male counterparts. They have often suffered the fate of women painters, of being considered wives and muses rather than artists in their own right. With BBC Radio 3 running a series of programmes to celebrate their achievements as part of International Women’s Day this is a great time to feature Barbara Strozzi – the most outstanding female composer of the seventeenth century. Barbara Strozzi was born in Venice in 1619 to Isabella Garzoni, servant to respected man of letters Giulio Strozzi. Having been adopted into the Strozzi family, Barbara studied music and developed an outstanding singing voice. Giulio founded his own Academy devoted to music and when Barbara sang to audiences here, her talents as a musician became clear. She not only sang at the academy meetings but was closely involved with the work of the academy and proposed topics for the other members to discuss. As well as being a gifted singer, Barbara was also a talented composer and she studied with composer Francesco Cavalli, and her music evokes his spirit. Fellow composer Nicolò Fontei dedicated two books of solo songs to Barbara, the first when she was only sixteen years old. 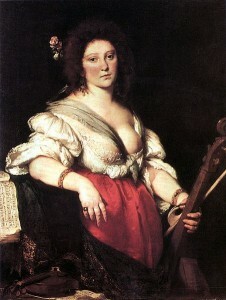 Strozzi published her first compositions in 1644. These were madrigals that set poems by her father. The remainder of her eight published collections appeared after Giulio Strozzi died in 1652. He had little to leave her, and she may have been motivated to publish partly by financial necessity. Barbara never married but she did have four children. It is supposed that at least three of her four children were fathered by the same man, Giovanni Vidman, a noted patron of the arts and supporter of early opera. Some have speculated that Barbara supported herself not solely through her music but also as a courtesan. Courtesans in Venice, at that time, were renowned for their high level of education, in particular their musical ability. The sole surviving portrait of her, (above) depicts her with one breast mostly revealed, tends to support this view. For reasons unknown, she left Venice for Padua and, after a short illness, she died in November 1677.